The official Q2 2014 release of UI for Silverlight brought a brand new theme inspired by the Visual Studio design with three color variations – Light, Dark and Blue. The following topic explains the specifics of the theme's color variations. The Dark variation of the theme is designed with a dark background in mind and it is recommended to use such a background in your application when choosing it. Below you can find the differences between the three color variations. Every brush has relevant HEX value in the corresponding color variation. * DefaultForegroundColor is the only resource of type Color and not a SolidColorBrush in VisualStudio2013 palette. Currently it is used only in the ExpressionEditor. Here you can find more details about each brush and where it is usually applied. The colors that have different HEX value can be ordered by purpose. First we needed another accent brush which has the same value as AccentDarkBrush for the Light and Dark color variations of VisualStudio2013 theme, but orange in the Blue color variation. This was necessary due to our aim to be as much closer as possible to the Visual Studio's product design. AccentBrush - another accent brush, usually used for border of elements in their MouseOver, Active, Toggled or Focused state. 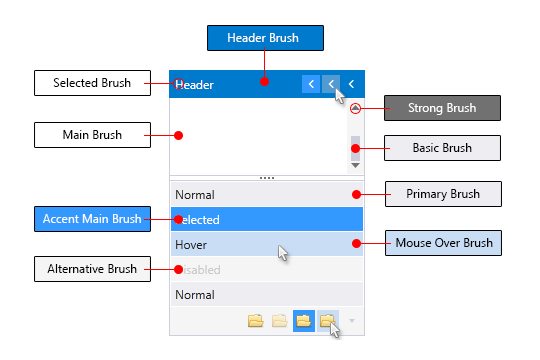 MainBrush - brush used for background of controls with direct input such as TextBox, MaskedInput, Editable ComboBox, AutoCompleteBox, PasswordBox. Also used as main background of elements that has different content with unpredictable background (PrimaryBrush or AlternativeBrush). PrimaryBrush - brush used for background of most of the controls that have no direct input in their normal state. AlternativeBrush - brush used as alternative background of PrimaryBrush. Also used as background of Popups and DropDowns. MouseOverBrush - brush used for background of elements that are in MouseOver state. BasicBrush - brush widely used for border color of controls in their Normal state. SemiBasicBrush - the same brush as BasicBrush with 40% opacity, used for background of elements that are in MouseOver state. 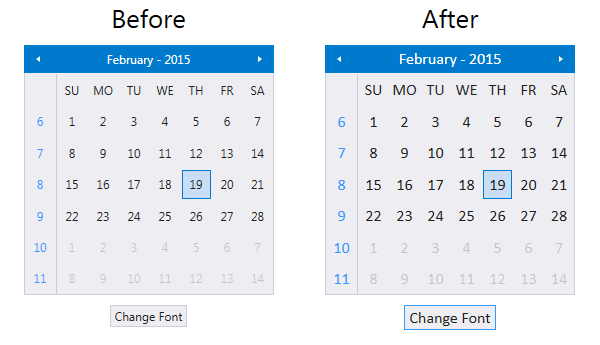 The official Q1 2015 release of Telerik UI for Silverlight introduced features that allow you to dynamically change the FontSize and FontFamily properties of all components in the application for the VisualStudio2013 theme. All Telerik controls use resources that are linked to one major singleton object that contains the FontSize and FontFamily properties used for the VisualStudio2013 theme. These properties are public so you can easily modify the theme resources at one single point. The most commonly used FontSize in the theme is named FontSize and its default value is 12. The bigger font sizes are used for headers and footers while smaller ones are used inside complex controls such as RadRibbonView, RadGauge, RadGanttView, etc. As for the FontFamily - there is only one FontFamily resource which is named FontFamily and it is set to Segoe UI. Please note that for complex scenarios we strongly recommend setting font size only initially before the application is initialized. We recommend font sizes between 11px and 19px for the FontSize property.